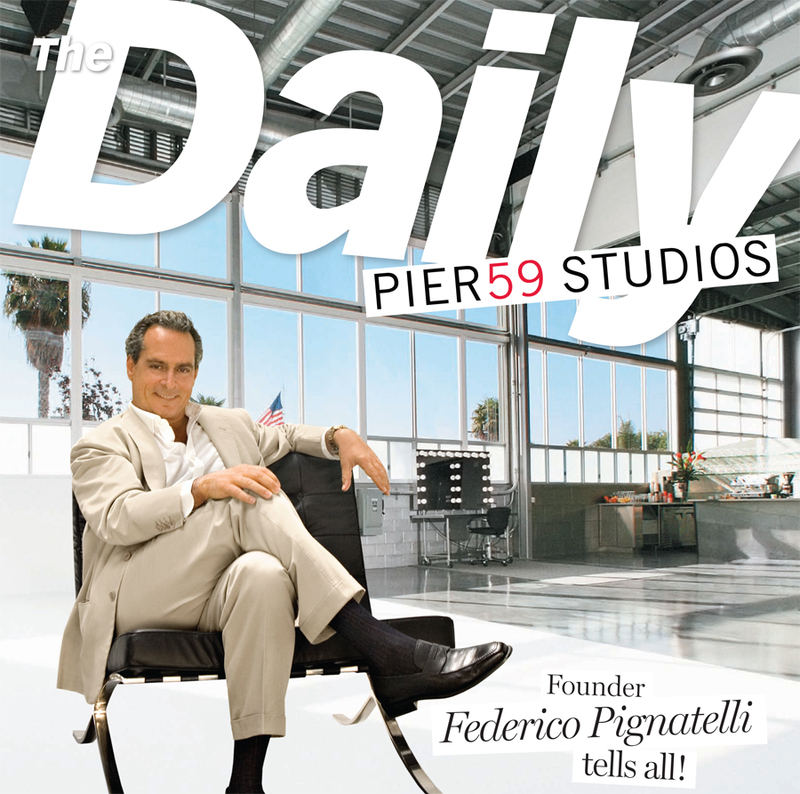 From Britney Spears climbing a volcano to Peter Beard coaxing an elephant into frame, Federico Pignatelli has seen it all at Pier 59 Studios. The Daily looks at the man behind the iconic photo studio favored by Meisel, Klein and Demarchelier. You’ve accomplished so much. What were your ambitions growing up? One of my ambitions was to be a very successful businessman and my other was to be a great photographer. I [also] wanted to study drums, but I never managed to do it. I’m a terrible musician but I love it. How did you make the transition from the business world to photography? It was part of my personal evolution to attempt to run a business and be artistic at the same time. Pier 59 and Art and Fashion Group is a major business but one that runs on enormous creativity. When I was a teenager, I loved taking pictures of architecture. I didn’t start taking pictures of people until my late 20s. My first subject was a former girlfriend, who at the time was a model. Photographers weren’t really capturing her beauty, so she asked me to shoot her. My pictures were so beautiful that her agency in Milan asked me to take pictures of many other girls they represented. How did it shift from your hobby to your business? I believed in digital photography from the beginning I understood the digital revolution would lead to more photo shoots. More photo shoots would involve more studios, as you can recreate digitally whatever you want, instead of going on location. So, I decided to invest in this huge field. Pier 59 back then was an abandoned pier and we had to completely restructure it. It was a huge undertaking but we made it into the largest complex of graphic studios in the world. You seem to be quite the Renaissance man. How do you balance all elements of your life and career? I have excellent people working for me. They manage the day-to-day operations and I give them freedom to express themselves. I guide them with a vision and goal and we work together to achieve it. What makes Pier 59 unique? I think that in New York, it’s the dimensions of the studios, the heights of the ceilings, and the location. NY is lacking in large spaces and the great thing about the studios is that the column-free space allows photographers enormous amounts of freedom in choosing angles to shoot. To have such a huge space in this city, on the Hudson River, is unique. I have been very involved in the design and style of the studio which is also very important. I brought the same concept as in NY to LA, and it has been very successful in both cities. Why do so many iconic brands and magazines want to shoot there? Because it’s a very functional space. Photographers like it and feel like it’s home for them and that they can create their best. It’s a good environment. It used to be mostly LA, but in the past year I have been spending more time in NY, and also traveling between Europe and South America. I am planning to open a studio in Dubai and Shanghai soon. We know you are friends with Roberto Cavalli—do you party with him often? In New York and Italy. He’s a fun guy. How can you not? I’ve been on his boat—it’s a beautiful boat, very modern. Tell us about your relationship with the late Helmut Newton? Are you friendly with any magazine? I wish I was. They are very difficult people to get to, and everyone needs to get to the top person, and we know who that is at Vogue. She is reserved and has come several times to Pier 59. She’s a stupendous woman, an elegant lady and someone I would love to meet. What fashion designers do you admire? I admire all the ones that are successful. One that I admire very much is Ralph Lauren, because I love what he has done—he’s an icon for Americans and for the fashion industry in general. Have you ever been to a fashion show? When was the first time you sat front row? I’ve been going to so many that I don’t remember! The first one I started going to regularly was Versace. I have been in Milan several times for Versace shows and they are spectacular. Europe, and in particular, Italy—that’s my country. I love to go to Sardinia, Sicily, Rome—which is my hometown-and Milan. Italy is beautiful absolutely everywhere. I also love London, Paris, Germany, and Prague. I wish I could tell you I run after pretty girls, but I don’t. I love the sea—I’m out on the boat a lot in the summer. I have horses and I like horseback riding. I love tennis, swimming and traveling. To me simplicity is elegance and elegance is simplicity. I dress simple, functional and good quality—from my shirt to shoes and jackets, it must be quality. What do you wear to work most days? I always have a jacket on me, because I hold these phones and I have to put them somewhere, but very often jeans and a jacket or otherwise a suit. I dress up more in Europe than America. Because America is a more relaxed working environment and Europeans tend to overdress a little bit, so I always feel underdressed in the streets of Milan, Paris and especially London. You have lived in Italy, London, New York and LA. How do those cities compare? They are very different. LA is a good base to have because you have space and good weather eight months a year. London is very international; New York is great energy; Italy is elegance and good living. Every one has its advantages and disadvantages. Ideally you want to put them all together and mix it up—and that would be paradise. You can do it digitally! Where did you travel this summer? I’m in Sardinia and I was in St. Tropez, and soon I will go to Prague. Hotel Romazzino in Sardinia is my fave and Pedrinelli is my favorite restaurant. I like tequila, but I like it straight. I’m not a cocktail person. I’m really a wine person. What are your favorite spots to power lunch in NY? Da Silvano, Serafina and at my good friend Victorio’s; he’s one of my very best friends. Not really in NY. I shop everywhere in Milano—I’m like a kid in a candy store. And I have my tailor in Milano and my suits, jackets and shirts are tailor-made by Rubinacci and Caraceni. Do you have a go-to pair of shoes? I wear a lot of Tod’s, I have to say. Nope. I smell pretty good as I am. What’s your favorite ice cream or gelato flavor? A masterpiece to me is Braveheart. It’s a movie about honor, strength and romance. I do like Robert De Niro, he’s an interesting and funny guy. I had dinner with him a few times in St. Barths and New York. I love Jack Nicholson, too. Cate Blanchett, Gwyneth Paltrow, and Juliette Binoche in The English Patient. I love rock and classical music. Right now I really like Ben Harper. I’m happy to say I meet all the important ones, because they come to the studios. Most are very humble, nice and down to earth. Richard Gere, for instance, was very nice and charismatic and a very good-looking man. When I am with my daughter, Lucrezia. Anything she likes to do. She’s a great swimmer. We swim and play together and she touches my heart. What have been the most memorable shoots for you? There have been so many! Britney Spears once shot at the studio and they created a volcano and a lake inside—that was an amazing feat of engineering to make sure the lake wouldn’t destroy the pier. It was for a cover and she was naked in the water and climbing the volcano. I didn’t think we would be able to do it at first, but we managed to pull it off. We’ve had elephants, tigers, and all kinds of animals at photo shoots. I know Friends used the studio as a backdrop. Have there been any other TV or movie cameos at the studio? Julia Roberts was a photographer here in Closer. How do NY and L.A. shoots differ? You shoot in L.A. because people like a change of scenery and want to be surrounded by good weather—NY winters can be nasty. But the main reason to use a studio in Los Angeles is that a lot of L.A. photo shoots involve Hollywood celebrities, and this makes it convenient for them to have a studio there. It enables actors and actresses to keep doing their jobs. Photographers who feel at home in NY can go to L.A. and feel like they’re home. Peter Lindbergh thanked me for making going on location easier. It can be problematic in a new environment and Lindbergh noted he had a home in both L.A. and NY, and thanked and hugged me for it. What famous campaigns were shot at the NY studio location? Most of the biggest designer campaigns! Which were shot in L.A.? Prada has shot in L.A., and tons of others. Will The Deck at Pier 59 reopen? It has not reopened yet, but it will eventually reopen next spring as a private, members-only dining facility dedicated to industry people. It will be a good place for photographers, producers, models and other executives to come, have dinner, network, and relax. Who are your favorite models? I have a long list. Gisele Bündchen is fantastic: She’s a great woman and the epitome of beauty and femininity. Adriana Lima is a friend; she is sweet and beautiful. Many beautiful models come from Brazil and Eastern Europe. Pier 59 is the place where so many gorgeous women shoot. It’s a tough environment to work; you can get distracted very easily. Do you watch most of the shoots? No. Clients love their privacy and there are 11 studios in NY and 4 in L.A., so I couldn’t possibly be everywhere. What are the best shoot meals? We have an Italian restaurant here, so it’s southern Italian food. If they want sushi or Indian or other food, we can organize it. Is there a most-requested dish? Spaghetti with tomato sauce and basil, and the warm chocolate-chip cookies are always winners. Vanilla ice cream with espresso is quite popular and you should see how the models eat! You think they don’t eat but I assure you, they do. Can you tell us some funny shoot stories? I went to the deck one day in late spring. I have this Balinese furniture outside, and on one of the tables I saw a beautiful black panther laying out enjoying the sun. Nobody was around. I wanted to pet the panther but I didn’t trust it. I went and asked the receptionist to find out who forgot a panther on the deck, and they got the guy. He came out and said the panther was indeed safe, and I had a chance to pet it. They had a hippo and snakes, too! What was the longest shoot ever? Mario Sorrenti would never leave the studio. He would be there the whole day and into late nights. He takes his time until he’s more than satisfied with what he’s done. He would start early and leave well into the early hours of the morning. Since its inception in 1994 by principal and sole owner Federico Pignatelli della Leonessa Art and Fashion Group has redefined the concept of a “full-service” corporation, providing a complete range of services and amenities for photo production professionals. Headquartered at the largest photo studio facility in the world, its own 100,000 sq. ft. Pier59studios complex in the Chelsea/Meat Packing districts of Manhattan, Art and Fashion Group offers top-of-the line equipment rental, the latest in digital advancements and retouching, fine Italian dining and an expert client services staff, as well as an exclusive restaurant and lounge, an affiliate talent agency, a host of prolific online services, and a new west coast Pier59Studios. For twelve years Art and Fashion Group has been a vanguard in the fashion and commercial photography, advertising, video production, and design communities; successfully anticipating the needs of its versatile and demanding clientele throughout pre and post-production. It is the ongoing mission of Art and Fashion Group Corporation to create an environment of service, quality and convenience that not only meets every client’s needs, but also inspires them to do their very best work. From conception to completion, from execution to exhibition, Art and Fashion Group Corporation provides for seamless and inspired creative experiences. Founded by Art and Fashion Group Corporation, Pier59 Studios is the premier photography and multimedia studio in New York City. The 100,000 square-foot photography facility and multimedia complex is the largest photography studio in the world, designed to accommodate the diverse needs of photographers, designers, advertising agencies, television and film production companies. Located at New York’s Chelsea Piers, Pier59 Studios is equipped with state of the art technology and provides modular, column free spaces to produce large-scale, technically complex photo shoots. Since it’s opening in 1994, Pier59 Studios’ attention to its clients has made it home to image-industry legends and trailblazers. Pier59 Studios features ten column-free studio spaces, including a 6,500 square-foot sound stage constructed for live performances, special events, video and commercial projects. Nine studios are naturally lit and contain retractable walls, light-sensitive windowpanes and specially poured cement floors for flawless camera tracking. All studios have 100mb internet connections, in-house catering for breakfast, lunch and dinner, 24-hour personnel for security, equipment load-in/out and equipment maintenance teams. Clients have on-site access to the Art and Fashion Group’s creative and digital departments, including retouching, printing, talent management and more. With the ability to combine multiple studio spaces and onsite digital services, projects can be planned, shot and completed entirely on the premises. Whether intimate or elaborate, commercial or fine art, traditional film or digital media, Pier59 Studios and Art and Fashion Group are here to bring creative visions to light. Industry Model Management is a boutique-by-design, New York styled agency, based in Los Angeles. In maintaining a very select clientele, Industry Model Management is able to better concentrate efforts on a much higher, personalized level of service and offer family-styled attention. Interested in and concerned with all aspects of a model’s career, Industry is a management-minded agency who never loses sight of the big picture. Owned by Federico Pignatelli, Industry Model Model Management is an Art & Fashion Group company, one in a stable of enterprises which includes Pier 59 Studios, Fashion-Films, fasionbook.com and Industry Management. Industry Model Management has the unique advantage of accessing the highest caliber of fashion and advertising clients in the world. With the ability to call on already existing, strong relationships within the working community, Industry Model Management has a distinct edge over other model and talent agencies. Fashionbook.com fills a unique niche in the multimedia production community by providing online portfolios, product and services to the global media and advertising industries. fashionbook.com is a source of virtual portfolios of all of the components necessary for production. Everything from photographers to art directors to locations and studios. Fashionbook.com offers its viewers a website that has an exciting and cutting edge design, yet is accesible, user-friendly and easy to navigate. fashionbook.com not only showcases the industry’s top talent, but is an invaluable marketing resource for its clients. At fashionbook.com customer service — from portfolio maintenance to client interaction — is the top priority. The diverse team behind fashionbook.com is a carefully balanced combination of experienced players in the creative and technical worlds who are committed to bringing the best representation and service to its clients and their industries. We aim to provide customized location production in the spectacular Bahamas, British and American Virgin islands and Caribbean. Our 63 feet motor Yacht, Silver Spirit, has a draft of less than 3 feet, ideal for low waters in most of the Islands in Bahamas, and is equipped with 2 powerful Mann engines of 1100HP each that allows for a speed of up to 40 knots with a remarkable range of 250 nautical miles. With such vessel our clients will be able to reach in shortest time the most remote and fashionable location for the most demanding photo and video shoots.